Please contact us with the contact form to report difficulties, strange behaviors or persistent problems, and quote the program name or the number 13524 . 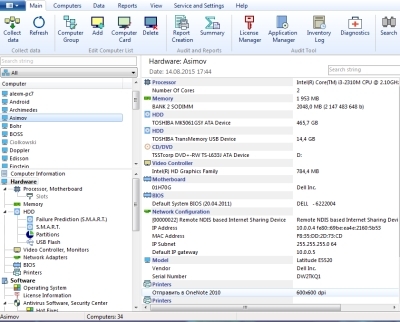 This is the download page for 10-Strike Network Inventory Explorer - The program scans hardware and software configuration of your network computers and builds the computer asset database. Generate professional-looking reports on hardware and software installed on the network computers. Watch, log, and track changes in the computer hardware and software. Monitor the computer health (remote HDD S.M.A.R.T., antivirus database, and free disk space monitoring). Be notified via email about the critical events and failures.